iPhone will now prompt to take a photo or select from photo library when adding a new profile. NOW FREE! HAPPY HOLIDAYS! FIND OUT IF ANY OF YOUR FRIENDS ARE YOUR PERFECT MATCH. FIND OUT IF THE PERSON YOUR DATING IS THE ONE. IT'S A GREAT ICE BREAKER WHEN MEETING NEW PEOPLE! 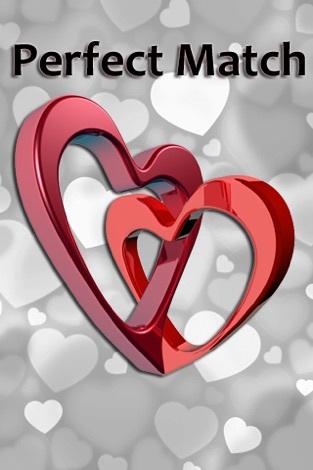 The Perfect Match is a revolutionary application that combines Astrology, Numerology, the Chinese Zodiac, shape and color personality profiles and good old fashion common sense to find your perfect match. Just enter your birthday and answer 10 easy questions then watch Perfect Match do the rest! 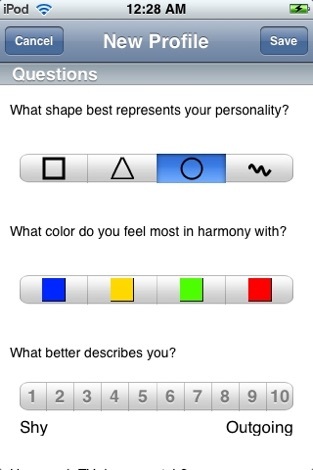 Perfect Match will take all profiles on your iPhone and calculate a match score rating that grades your compatibility. A detailed report provides a breakdown of each test with the end result being who is your Perfect Match, Perfect Fling, Perfect Friend or Perfect Stranger. Reports can also be shared via e-mail. How does it work? 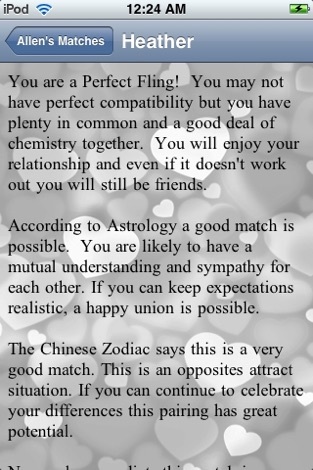 Perfect Match uses six methods to determine compatibly--Astrological Zodiac Sign, Chinese Zodiac Animal, Numerology Life Number, Color Personality Profile, Shape Personality Profile, and a Compatibility Questionnaire. Using each of these systems independently has an unacceptable rate of error which is why Perfect Match combines each test's individual results into a single, highly accurate match score. You could spend years of your life trying to determine if your with the right person or you can let Perfect Match tell you in seconds. This is not a Shanghai Rummy (Contract Rummy) game. 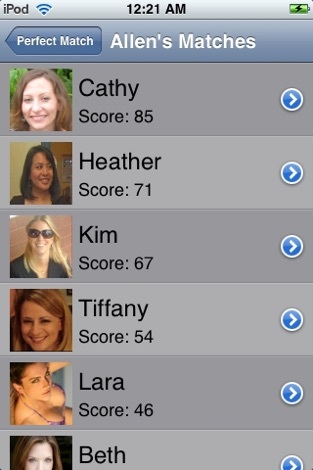 Shanghai Scorecard is a simple application that lets you keep track of your game scores without paper. Always know who the next dealer is, what the contract is, and who is winning.